Tech-loving makers around the world are inspired by Halloween to create pumpkins that shoot lasers, flash messages with lights or shoot silly string when someone walks by … all using LED lights, sensors or arduinos. They call them Hack-O’-Lanterns. Roll up your sleeves, clean that cold goop out of your pumpkin and get making. 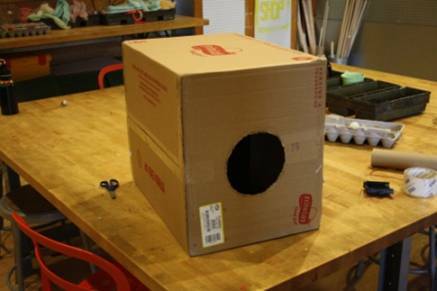 Click here to learn how make a “hack-o’-lantern” from Instructables.com! This easy how-to, Tiny LED Jack-O’-Lantern, from Instructables.com is a great start for YOU, kid makers! Maker Zack Scott takes you step by step through the lighting of a pie pumpkin with an LED module. He shares photos for each step. When its done, you have a little jack-o’-lantern that lights up with the flick of switch on the back of the pumpkin! Zack draws his circuit diagram to show you just how the electricity needs to run between the batteries, switch and light. Learning to build a simple circuit like this opens the door for all kinds of other projects. For example, make your Halloween costume light up with the simple circuit in our Light Up Wristband how-to. Wondering where to find the parts to make your own hack o’lantern? Have you ever dreamed of building your own flying machine, kid makers? Learn to make a leaf blower hovercraft with kid maker Ethan and his assistant, maker Matthew Beckler of Wayne and Layne. It’s cheap, SO EASY and can even lift the weight of an adult. We can’t wait for you to try it yourself. Click here for full project instructions. Let us know how your hovercraft flies at info@makeshopshow.com. Click here for instructions from the We Made That blog. 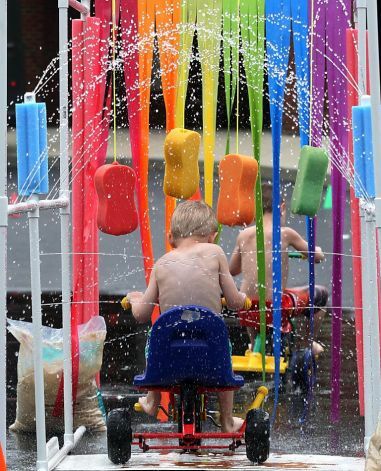 Summer isn’t over yet, kid-makers, and we know you’re still looking for ways to turn your backyard into a water park! Add to the splashy fun of the Water Bottle Sprinkler and Backyard Bike Wash projects we posted earlier this summer with your own homemade waterslide! Some people call these “slip and slides”, after the popular toy. Slip and slides are simple to make and super fun for adults and kids alike. 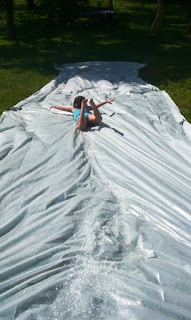 The kind you buy at the store, though, can be too narrow or too short, which is why when lots of folks think of slip and slides they think of ….. grass burns! As makers, we like to improve on things so that they work better. That’s part of why we loved these instructions of how to make your own slip and slide that’s 10 feet wide by 25 feet long from the We Made That blog! In fact, you can even buy plastic rolls at the hardware store that are 10 feet wide by 100 feet long for as little as $5. Kid-makers, we know you just can’t wait to run into the sunshine this summer break to play. This cool project idea can quickly turn your backyard into a DIY water park! 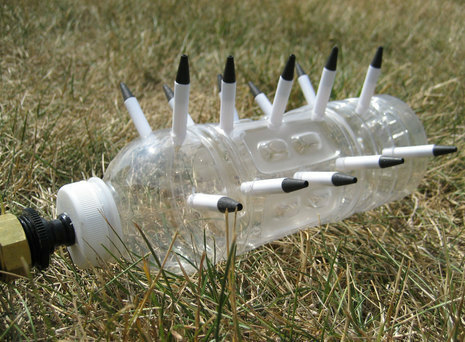 Click here for instructions from Curbly.com on how to make your own backyard sprinkler out of an empty water bottle, old ball point pens and a garden hose. You do need 2 things you won’t have lying around the house but together they cost less than your $5 allowance.